When it comes to window dressings, most people will choose between blinds and curtains, without even considering shutters. But window shutters can add an extra touch of luxury to your home, providing warmth and security. 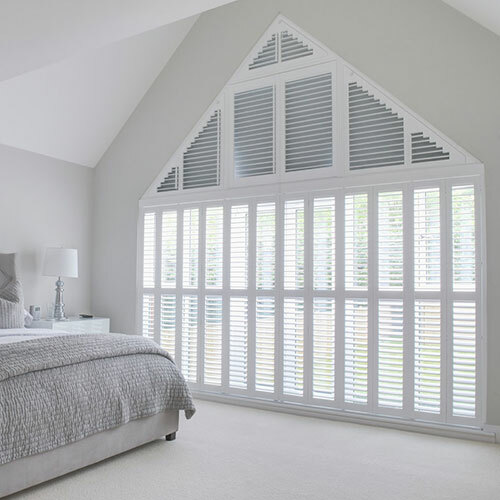 There are a huge variety of window shutter styles available, but understanding the difference between the types of shutters and their benefits can be confusing, so we’re going to give you a quick overview. Find out more about types of window shutters below. The classics never go out of style, and the same can be said of wooden shutters. Add a touch of timeless style to your windows with beautifully crafted wooden shutters in a range of styles and finishes. Strong, waterproof and long-lasting, vinyl shutters are the most practical option for some rooms in your home. Bathrooms and kitchens produce a lot of moisture, which means vinyl shutters are best suited, but our vinyl shutters are high-quality enough to feature in every room of the house. Enjoy a restful night’s sleep without being disturbed by noise or light outside thanks to blackout shutters. We’re proud to say that our blackout shutters provide 99% blackout without compromising on style. They block out external noise too, making them ideal for in the bedroom or nursery. Not all windows are made equal, and nor are window shutters. If your home has uniquely shaped windows, make a statement with shaped shutters. Specially designed louvres and unique mouldings can be tailored to fit arch windows, porthole windows and many more. Café shutters are designed to offer privacy without completely blocking out light. The bottom half of the window is shuttered, while the top half remains open, giving you the best of both worlds. This type of shutter is ideal for front-facing windows in the home. Café shutters add character and charm reminiscent of Mediterranean villages. The more traditional shutter option, solid shutters are a single solid panel which opens on a hinge independently of the window. Available as full height, tier on tier or combination, you’re free to create the exact look you want in your home. Bay windows are a beautiful feature in living rooms and bedrooms, but they can be difficult to dress. Choose bay window shutters for an elegant and timeless look. Our exclusive BayPole shutter design fits the shapes of your windows perfectly. French, patio or bi-folding doors require tracked shutters to fit securely without hindering their opening mechanisms. Our range of simple and stylish tracked and sliding shutters do just that, ensuring an effortlessly smooth transition every time.